Today's the last day to enter my 200 follower giveaway. The link is on the right hand side of the blog. Follow Friday Fun Week 14 - this weekly meme is hosted by Parajunkee and Alison Can Read. Check out their blogs for details/rules, and to join! Also, be sure to check out this week's featured bloggers on each of the girls' sites! This week's question: Do you have a favorite series that you read over and over again? Tell us a bit about it and why you keep revisiting it. Alison, one of the hosts of Follow Friday said that all the FF questions seem to lead back to Twilight and Harry Potter for her…well for me, it’s Harry Potter. It seems like I mention HP almost every week, and this week will be no exception. I love Harry Potter more than I can say. I’ve read books 1-6 multiple times, and I just read book 7 for the first time this year because I wanted to read it before I saw the movie. Even though I bought the book the day it came out, I put it off for years because I was so afraid of what would happen, and I knew that once I finally read it, it would really be the end. You can only read a book for the first time once. 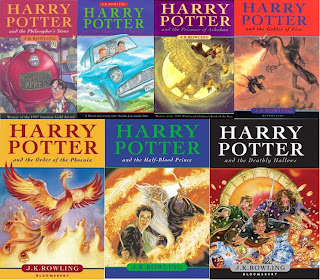 Yes, I can re-read them and watch the movies (and I will), but it’ll never be the same. A series I would like to re-read but haven’t yet is The Chronicles of Narnia. I loved those books, and they’re definitely worth a re-read. TGIF at GReads Week 10: TGIF is hosted by Ginger at GReads - be sure to check out her blog and join in the fun! This week's question: Reading Challenges: Did you sign up for any this year? How has your progression been? I only signed up for one reading challenge this year – BCC's Summer Romance Challenge – because I didn’t start book blogging until May. I definitely want to participate in a bunch for 2012 because I think they're a great way to make reading goals and stick with them. Hopping through. Good point that you can only read a book for the first time once. That has a special magic. But I also love how the book becomes richer on re-reads. I can never blame someone for choosing Harry Potter. But lets talk Narnia for a moment. What was your favorite book? I love The Voyage of the Dawn Treader. That's a book I've probably read ten times or more. I really like Edmund and Lucy. I love watching Eustice mature and become a great guy. I had a crush on Caspian as a kid. :p And who doesn't love Reepicheep? (May have misspelled that last one). Now I want to go and read it again. Great pick! I chose Harry Potter as well - it's definitely one of those series I can read over and over again. I am also the same exact way about series that I know are going to end... I'll put off reading the last book for as long as possible, because it's so sad to let go! Hi & Happy Friday Marie! Also, dont forget to enter our SIGNED Enthralled giveaway. Yes I'm seeing the HP/Twilight trend a lot today. I actually chose Twilight myself. I wish I could set a challenge goal and stick with it, but it seems I like to rebel even against myself when I set a goal that dictates what type of book to read. Good luck with your challenges next year! I love Harry Potter so much too! I have read all the books multiple times and listened to the audio books a bunch too! Ill never get tired of them. I hope you will stop by and check out our twitter event going on today! I keep forgetting that I have the seventh HP book, even though I got mine when it came out, too. I don't want it to be over! So I think I just keep forgetting the last book's sitting on my shelf, lol. I've promised myself I'll finally read it the next time I read through the series.